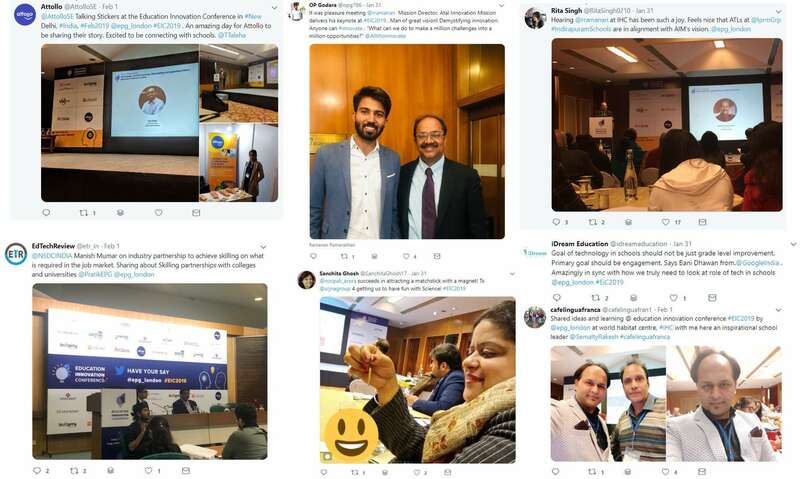 The EIC2019 concluded on 1st February in Delhi with a full-house and attendees from all across India attending the K12 and Higher Education streams. The K12 hall, moderated by Rishi Kapal, CEO and Chief Strategist of edtech accelerator EDUGILD, saw an inspirational keynote address from Ramanan Ramanathan, Mission Director of the Atal Innovation Mission (AIM). According to the #eic2019 twitter feed, this was the highest-rated session of the day. Ramanathan was a senior vice president at TCS, promoted by government to head the AIM, which sought to bring in best of private minds to drive innovation in governance. In the period since he has taken over more than one-third of the scheduled 100 or so Atal Tinkering Labs have been installed, providing children the ability to exercise their left-brain in a way not available before in Indian schools. That said, some of the principals attending conceded in more informal settings that, while they have signed up for the Labs, there was a lack of awareness or familiarity of what to do next to maximise their use. The conference saw participation from edtechs, government, education leaders and NGOs. From government, EIC2019 saw leaders from across government, including Dr Anil Sahasrabudhe (Chairman, AICTE), Dr Pankaj Mittal (Additional Secretary, UGC) and NSDC’s MD and CEO Manish Kumar speaking. According to the UGC, the fastest growing job areas in 2030 will be ones that are in their infancy today, including artificial intelligence, drones, wearables, virtual reality, cryptocurrency and genomics. Current government regulation depresses the market for drone-tech and crypto, while other countries like Malta are more welcoming – Zebpay, one of India’s largest virtual currency exchanges, now has a registered office in Malta, after shutting its operations in India in 2018. Such regulations will have to change rapidly in the coming years to keep India’s tech sector globally competitive. And in the process, companies like Ebix Smartclass, SkillSanta and Arc Skills, all of whom presented at the event, hope to be at the forefront of addressing the challenges that arise from the market disruption. In such a transformative environment, Gaurav Kumar, a vice president and head of strategy at Reliance Jio responsible for edtech initiatives, characterised Jio’s priority as wanting to “create the world’s largest edtech”. He explained Jio’s scale of ambition as reaching thousands of governments schools across the country in a very short time, with a wish to create a step-change in the learning ecosystem. Similarly, the interview session with Manish Kumar highlighted the importance of not just talking the talk, but walking the talk. He was candid on the evolution the organisation has gone through in the past decade, reinventing itself multiple times. His colleague Soma Sharma, head of analytics and research, expanded later to say that the organisation’s is highly-data led – the only way to operate in a country so heterogenous, and in a job market changing as fast. EIC2019 saw attendees from as far afield as Toronto in Canada, Mississippi in the US, as well as England and Wales. Canadian social enterprise Atollo was represented by CEO and Co-Founder Lak Chinta, who showed how audio-visual learning can transform the learning dimension and develop the cognitive potential of children in India. US startup Campusknot returned to EIC after attending our London event, sponsored by Microsoft, two years ago. British animated video company VideoScribe seeking to expand their Indian presence after coming on a British government delegation. Later sessions in the day, included discussions around how schools and students are responding to tech innovations, including feedback from educators and students. Companies like Lit Skills are developing innovative products to help students develop social and emotional learning skills, with a high degree of take-up and retention. Vinesh Menon, head of the education and skilling vertical at Vibgyor Group of Schools, ended the last panel with the million-dollar question: we’ve had a number of interesting conversations today, but after this event is finished, what next? From EPG’s perspective, the work to support the education and edtech ecosystem in India, particularly in finding international opportunities in Europe, the UK and East Africa, continues. We have an upcoming delegation to the UK in June 2019 (our second of the year), our next EIC will be in Bangalore in November and, in the meantime, we will supporting a number of government and private sector initiatives to construct innovative business models in Indian education. If you would like to find out more about our work, come out our delegation to the UK or attend EIC2019 in Bangalore, please do get in touch. We would be delighted to hear from you.